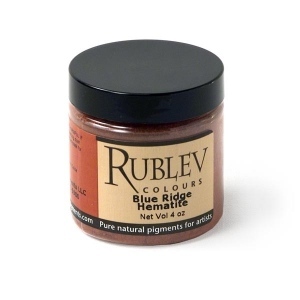 Details Rublev Colours Blue Ridge Hematite, is a natural red iron oxide from the heart of the Blue Ridge Mountains of Virginia. The high iron content (over 80%) makes it a strong tinting pigment. 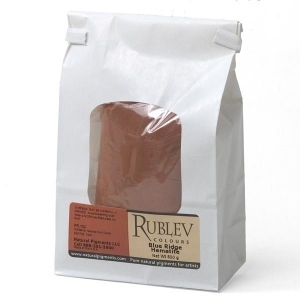 Natural red iron oxides are opaque, absolutely permanent and have excellent covering power. They are strong absorbers of ultraviolet light. The best bluish shades are called Indian red; the yellowish shades, light red, English red, and Venetian red. Formerly there was much confusion in the nomenclature of the red oxides; the terms given in this list are those specified in the ASTM standard. Natural red iron oxide is based on the mineral ore hematite. The word hematite comes from the Greek word hema, meaning blood and was given the name "bloodstone" in ancient Greece (Theofrastus, c. 325 B.C. ), implying that the mineral is blood red in color. Hematite is an important ore of iron and its blood red color in the powdered form lends itself well as a pigment. Hematite is among the oldest pigments known to humankind and has been used by every major civilization. In nature, hematite rarely occurs as crystals but usually as nodules or earthen masses. The color of the crystalline form varies from steel-gray to black, while crypto-crystalline hematite is dull red to bright red. This common mineral is found in deposits of the most diverse types. There are several varieties of hematite, two of which are suitable for use as pigments: oolitic hematite, which is a friable earth composed of small rounded grains of dark red color that are lustrous and greasy to the touch; and hematite rose, a fine-crystalline and crypto-crystalline form of hematite of red color, which are usually encountered in friable earthen masses or reniform aggregates of bladed crystals in a circular arrangement giving the appearance of a rose. Red iron oxides (hematite) are found around the world and have been used as pigments since prehistory. Pigments made from the mineral hematite are dependable in mixtures with all other permanent pigments, and are considered to be permanent with considerable tinting strength and opacity. They do not react with solvents, and are indifferent to alkalis, but are partially soluble in acids. 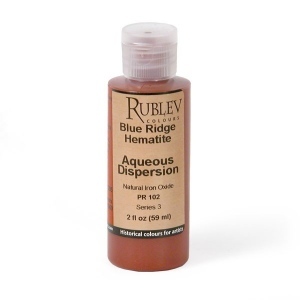 Zinc white and hematite yield excellent flesh tints (in oil paints you may want to substitute zinc white with another transparent white pigment). Mixtures of alizarin or madder lake and hematite were offered as Tuscan red or Pompeian red, according to F. W. Weber. Alizarin or madder lake in this mixture does not fade as readily when mixed with iron oxide hydroxide pigments such as ocher and sienna. Hematite absorbs a moderate amount of oil. The oil absorption ratio is 20 parts by weight of linseed oil to 100 parts by weight of pigment. If the measurement were grams, hematite would require 20 grams of linseed oil to grind 100 grams of pigment to form a stiff paste. It forms an average drying oil paint, and a hard, fairly flexible film. Hematite is not considered to be toxic, but care should be used in handling the dry powder pigment to avoid inhaling the dust.